The vast majority of the rock/blues world’s thoughts have been with Walter Trout recently. Stuck in hospital and forced to appeal to friends and fans for money to raise funds for a life or death liver transplant, the people who love Walter and his music were waiting, breath held, to see if the prolific bluesman was going to live to play once more. At the moment of writing, Walter’s operation has been a success, Walter is recuperating and things are looking up, but recovery is a long process and we cannot take anything for granted. What could have happened isn’t worth thinking about, but the tone of this review could have been much different and it’s slightly easier to leave sentimentality aside knowing that he is still amongst us. Only slightly, mind you, because Trout’s illness and deteriorating heath feature in the lyrical content. The first track is called “Wastin’ Away”, opening with the lines “Lookin’ in the mirror/I don’t know who I see/So I take another look, baby/But it still don’t look like me/Guess it’s the the price got to pay/And I feel like I’m wastin’ away”. It’s difficult to listen to that, knowing everything you know, and not feel the full weight of the song. The theme of illness, the battle and everything he has to live for feature heavily throughout this excellent piece of work. The production by Walter and Eric Corne gives the whole album a dark, intense almost oppressive feel to it; “The Blues Comes Calling” is no walk in the park, but it richly rewards the listener who is willing to open their heart to the music and words. There are ten new Trout-penned songs here to enjoy, as well as a superb instrumental featuring John Mayall, “Mayall’s Piano Boogie” and J. B. Lenoir’s “The Whale Have Swallowed Me”, a perfect cover song for Walter given his circumstances. This is a really terrific album from Trout and his fellow musicians; it is absolutely impossible to do anything other than sit back and simply enjoy it. My personal picks would be the aforementioned “Wastin’ Away”, the emotionally draining “The Bottom Of The River”, a new Trout classic, “Willie”, the slow-burning “Hard Time” and his tribute to Marie, “Nobody Moves Me Like You Do”. However, there is nothing on this album that falls short of overall excellence, so picking highlights is a rather difficult task. The overall tempo of the album is a little slower that the usual blistering blues we’ve been used to from Walter, but this is a very powerful and emotional collection of soulful blues songs. I think it would be dishonest of me not to mention that the vocals are less powerful than they once were, for obvious reasons. These are still committed, fine vocal performances, but fans will notice the difference. “The Blues Came Calling” is an engaging, vital example of Walter Trout’s art, yet another album to offer proof of why those who know blues rock revere the man so and a timely reminder of what we could have lost. Don’t buy this album for sentimentality’s sake, though, buy it because it is one of the finest blues albums you will hear all year. 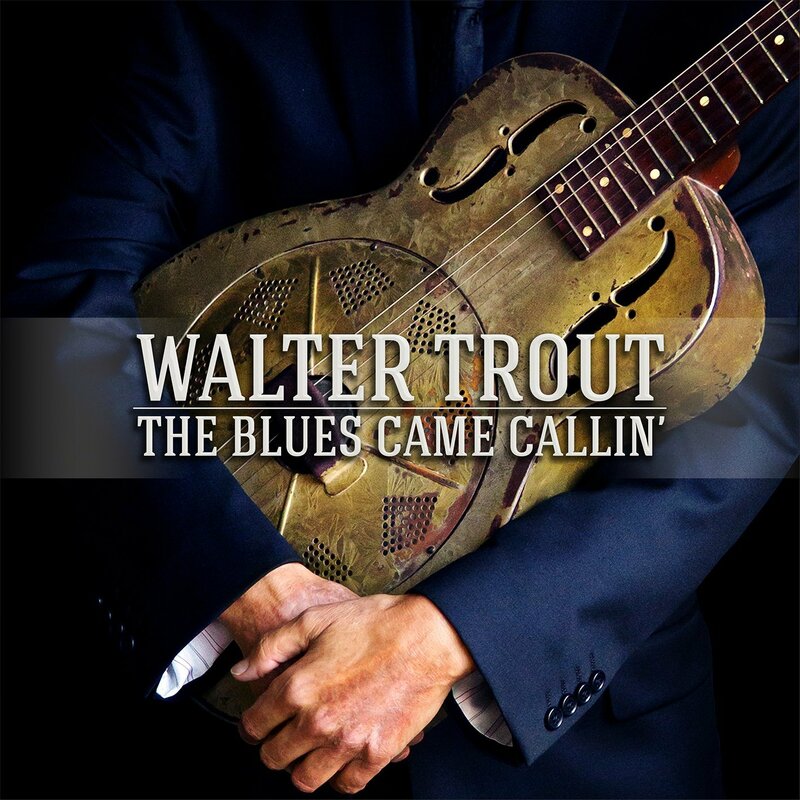 Walter Trout’s “The Blues Came Callin'” is out now on Provogue Records. This entry was posted in Album Review, Music and tagged Album Review, Blues, blues rock, John Mayall, Provogue Records, The Blues Came Callin', walter trout. Bookmark the permalink.